A single 200-watt Warm White Ultra Bright LED provides the light output of a 750-watt halogen bulb with less fan noise, heat on performers and audience, and power consumption. The COB design improves light distribution, whether it's used via DMX as part of a stage lighting grid or with onboard control of brightness and strobe for set-and-forget operation. 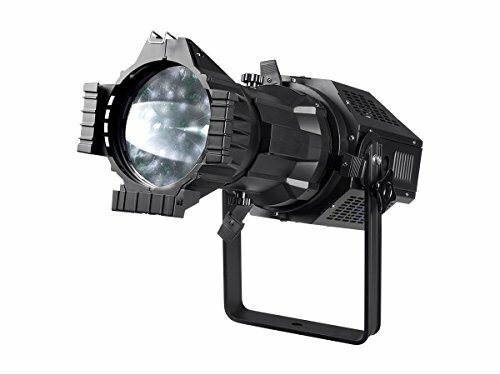 This ellipsoidal heavy duty housing supports rigorous road use, with manual focus and frame shutters for versatile light placement. This is a professional-grade lighting fixture for churches, theaters, clubs, artistic installations, video productions, and other events where crisp bright, lighting is needed with low power draw. Even multiple units won't disrupt intimate venues with its near-silent internal fans.